Most people tend to believe the lower end is always the strongest segment of the real estate market. 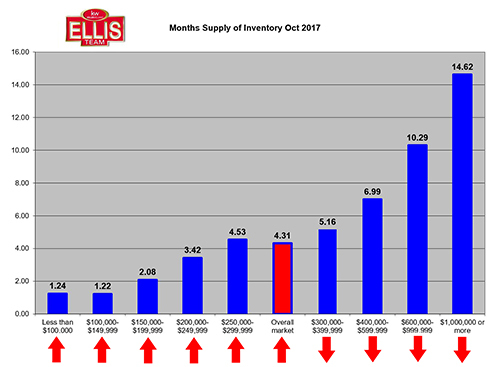 If you looked at the October Months’ Supply of Inventory you would agree. The months’ supply graph is a snapshot in time, so we added a little something to it this month. Upper end homes leading the SW Florida real estate market. What if you looked at the change in direction from our previous snapshot in July? Would that change your opinion? Static data paints a picture and changes in direction tells a story. The changes are not huge numbers. For instance, the $Million+ went from 15.66 months in July down to 14.62 months in October. Each price point above $300,000 saw a reduction. Each price point below $300,000 saw an increase in months’ supply. Many times, we see a price range here and there flip, so it stood out to us when we saw such a shift up to a point certain. So, what does all this tell us? Perhaps a lot, and perhaps not much. It tells us we should keep an eye on it more so for the change in direction than for the change in numbers themselves. You see, the number change isn’t particularly significant. We did have a disruption in the market in September. Could it be that lower end homes were hit harder than upper end homes? Possibly, but if it were true that closed sales were disrupted you would also think that current inventory would be disrupted too. Could it be that prices have risen to a point where first-time buyers and below $300,000 buyers are tapped out and can’t afford more increases? If the latter were true we’ll see that going forward. Keep in mind, as season approaches we’ll have more listings coming to the market and more buyers from up North buying homes too. That can skew local buyers’ affordability issues until after season. My intuition tells me numbers going forward will be strong. While we’ll track these numbers going forward they may just be a blip. I would have expected the lower end to have done better simply because we see lower end homes being gobbled up in days if not minutes. We like to report the numbers as we see them. We don’t use the numbers to prove what we think is happening in the market. The numbers tell us what actually is happening. From there we can interpret what we think it means, but it does no good to try to use numbers to prove a point just to be right. Throw in a hurricane for good measure and numbers can state about anything you want them to say. We’ll report September housing numbers for Southwest Florida soon. As you would imagine, our market was disrupted, and the numbers bear that out. We may even see a rise in October numbers due to sales that were postponed from September. Our team is bringing several homes to market. We’ve got some good values and more coming. If you’d like to search the MLS like a pro, visit www.LeeCountyOnline.com Customers love it because the data is updated instantly. This past week a customer asked me why a home shows one price online but a different price on our website. I explained that our website has an instant feed, so when any agent in MLS changes a price or adds a new listing, it shows up right away on our site. This is particularly important when you’re looking to find the right home. Speed wins, and beating out other buyers to hot new properties can be the difference between owning that home and watching someone else buy it. The same is true with price changes. Imaging having your eye on a property and seeing it sell because it was reduced. But you didn’t see the reduction because the site you use never displayed it. It was sold before they could display it. That doesn’t happen with our website. If you have a property to sell, the Ellis Team can sell it fast and for Top Dollar. Call Brett or Sande 239-489-4042. We can help you buy that dream home too. Always Call the Ellis Team at Keller Williams Realty! How Does Financing Impact Cost of Ownership? How Does Financing Impact Cost of Ownership? We’ve found that three items have the largest impact on the cost of ownership due to financing. The most talked about are the amount financed and the rate. For a moment, let’s talk about creating real equity while thinking like an investor. Payments are lower on 30 yr loans than 15 yr loans so most people choose the lowest payment. What if you could afford the payment on a 15 year loan? Would it make much of a difference? If you look at the sample chart, a 30 year loan pays down about 25% of the original loan in 15 years compared to 100% on a 15 year loan. Let’s say you have a $250,000 loan at 4.125%. The P&I (principal & Interest) portion on a 30 yr loan is $1,211.62 That same loan on a 15 yr is $1,864.92. But wait, there’s more. 15 yr loans carry less interest rate. Currently 15 yr loans are at 3.5% which brings the payment down to $1,787,21 That’s a $575.59 difference per month but the law of compounding saves you much more than that. Had you financed this for 15 years you would have paid back the original $250,000 plus $71,697.14 for a grand total of $321,697.14 That’s a lot less than $436,184.76. In fact, it’s $114,487.62 less. If you have the wherewithal to finance for less time you might wish to consider it. If you’re disciplined you might consider taking out 30 yr loan and paying like it’s a 15 yr loan. However, you will pay .625% more in the rate and it will require discipline. The other two factors besides length of loan is the rate and the amount financed. A good agent can help you with both. Knowing which lender is best for you requires some knowledge. Each borrower has a unique set of circumstances. Some lenders offer better rates on FHA loans than others, while some lenders specialize in conventional loans. We have lenders that offer bridge loans, construction loans, FHA, VA, USDA, bond programs, lot loans, portfolio loans, investor loans, and foreign national loans. If all this sounds confusing to you, you need to work with an agent that can point you in the right direction. Sometimes as agents we don’t know your full situation. This is why we work with lenders we can trust so we can point you to the right program for you. Knowing the right people and who you can trust makes all the difference. An agent might negotiate a few thousand off the purchase price for you, but if you choose the wrong lender you can pay it all back and then some simply by choosing the wrong loan. Most buyers focus on price of the home. We like to look at total cost of ownership. This includes price, rate, taxes, and other fees like HOA or condo fees, CDD’s, etc. This way you can make a fully informed decision and make that dream home become a reality. We hear stories where that dream home turned into a nightmare home because the buyer didn’t understand the full scope of the purchase. We want you fully informed. You can search the MLS like a pro at www.LeeCountyOnline.com It’s the best property search website in SW Florida. However, please talk to an agent on the Ellis Team before you purchase. Not using us could cost you thousands. Our agents offer peace of mind. 239-489-4042. Posted in Cape Coral Real Estate, Fort Myers, Fort Myers Real Estate, Open House, Southwest Florida Real Estate. Every day we get questions from buyers and sellers. We thought we’d provide expert answers to common real estate questions we hear often and inform readers because they may have similar questions. What is Definition of a Sellers Market? Most experts agree that 5.5 months’ supply of inventory is a balanced market. Anything less than 5.5 months’ supply is considered a seller’s market and anything more is considered a buyer’s market. Keep in mind the same local real estate market can have sectors. Certain price ranges in SW Florida for instance could be a seller’s market while other are balanced or a buyer’s market. How Much Money Do I Need to Purchase a Home? We sell homes ranging from 0% down all the way to 100% cash. There are various loan programs available to buyers. Knowing who has the programs and what income and credit scores you need to qualify are the key. There are even down payment assistance programs and bond money available. The best thing to do is call the Ellis Team and we’ll put you in touch with someone who can help. Do I Need to Sell My Current Home to Buy Another? Not necessarily. We’re seeing a resurgence in bridge loans and equity loans. Scoring that dream home in paradise can be difficult with low inventory. A bridge loan is a loan from the bank to cover an interval between two transactions. It’s a bridge to get from one transaction to another, thus how it got its name. We have people who do these loans so you can buy your dream home, then we sell yours for Top Dollar. How Many Homes Do Most Buyers View Before Purchasing? NAR says it’s 12. It really depends on the market and price range. For instance, if you’re shopping in the $200,000 price range in Fort Myers, there may only be 4 homes that match your criteria. Other price ranges may offer more or less. If you’re working with a great real estate agent who listens to your initial needs, you may not need to see more than 3 or 4. Viewing more homes doesn’t make you a smarter shopper. It just takes more time, and as time slips by, so do the homes you’re thinking of purchasing. Speed wins. You’re in competition with other buyers, not the seller. You want to identify the best home as quickly as possible and snag it before another buyer does. Should I Get a Home Inspection? We recommend them. You want an expert who can identify problems you might not see with the naked eye. Inspectors offer years of experience and wisdom. Not every finding is a cause for concern. An inspection can be peace of mind even if it identifies maintenance items you should be aware of down the road. When something major is found a request to either repair or replace it can be made to the seller. Failing that the buyer may cancel the contract the contract depending on how the contract was written. An experienced agent can walk you through your options, before and after the inspection. Do I Need an Agent For New Construction? Yes, you should use an agent always. Experienced agents are aware of discounts and opportunities the builder may not tell the public. Additionally, the developer wants to sell one product, but is that the right new construction product for you? Agents can show you all the new construction projects that meet your criteria, not just one. Whether you’re looking at new construction, resale, or both, you should always use an agent. It doesn’t cost more to use one, but it sure could cost you if you don’t. If you have more questions, Always Call the Ellis Team at Keller Williams Realty. We’ll be glad to answer your questions. You can search the MLS like a pro for Free at www.LeeCountyOnline.com Or call us at 239-489-4042 We’re here to help! It’s a few weeks after hurricane Irma and already we see Lee County sellers enjoying inventory supply advantage the first week of October. Last week we told you that the hurricane could become a tremendous opportunity for SW Florida home sellers. Inventory was already low at 4,666 at end of August. We predicted a possible 10% decrease in inventory which would take us down to 4,200 listings. This week single family inventory stands at 4,248, so that assumption has come true. 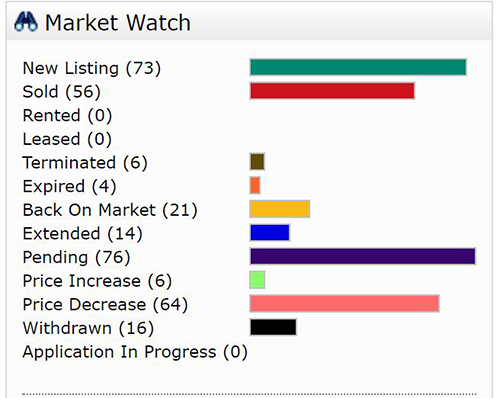 In the last 24 hours 73 new listings have come on the market, while 76 went pending. This tells us that early in the week more people are buying than deciding to sell. If this continues, inventory will fall even further. Each year, many home sellers decide to sell in January. I guess they think somehow, it’s a better time to sell as more visitors are here beginning in January. It is true, we will have more people here January through March. It’s also true that those visitors will have many more listings to choose from than they do now. So as a seller, is it better to sell in season, or now? We believe it may be better to sell now. We have lots of buyers ready to purchase now. We have low inventory. Buyers just do not have the choices now that they will have in season. Sure, there are lots of buyers that do not have to buy now. They can wait for more choices. However, some do not have that luxury and need to buy now. Isn’t it always better to sell when people need to buy and there isn’t much to choose from? Imagine the stores just before the hurricane. If you got there late and there were only a few cases of water, did you care what brand it was? Did you care if it was 50 cents more than the brand you usually buy? No, you needed water. You recognized scarcity and what it would mean if you didn’t buy it. If you are thinking about selling, you are a store right now and the shelves are kind of empty. Maybe not completely empty, but definitely not full. In January, those shelves will have more on them. If prices go up in the next 3 months, many of those potential buyers may become lookers. If you think there are lookers in this market now, wait until season. Just because the roads become clogged doesn’t mean everyone here wants to buy. Many look, and look for years. If they don’t see SW Florida as a bargain, they may not buy. If prices go up in the next 3 months, we may not look like a bargain. And who wins if that happens? The sellers who decided to sell when the shelves were bare and the buyers needed to purchase. Nobody knows how the market will be next season. We do know the market today, and there are opportunities. The data agrees. Please call Brett or Sande at 239-489-4042 to see how much we can sell your home for and how much you would net at closing. If you’re looking at buying, speed is key in this market. www.LeeCountyOnline.com is the fastest real estate search engine. It has all the listings and is updated every few minutes, which is key when you’re competing against other buyers to score that dream home. Always call and Ellis Team agent and we’ll help you locate and close on your dream home. Finding it is one thing. Actually buying it and closing it is another, and that’s where our agents shine. We look forward to helping you buy or sell. Let us know how we can help you. Now may be a good time to sell your Southwest Florida Home. We have buyers who need housing after Hurricane Irma. Posted in Cape Coral, Cape Coral Real Estate, Fort Myers, Fort Myers Beach, Fort Myers Real Estate, Gated Community, Golf Course Property, Open House, Reflection Lakes, Southwest Florida Real Estate.